In 13 concerts spanning seven seasons, Scott Metcalfe and the singers of Blue Heron have undertaken not only to perform the complete works of Johannes Ockeghem (ca. 1420-1497) but also to place them in context by exploring the works of his contemporaries and followers. Last night’s concert at the First Church, Congregational, in Cambridge — the sixth in the cycle — centered on a complex of interrelated songs and masses by Ockeghem and other composers working in France and the Low Countries in the second half of the 15th century. As Professor Sean Gallagher pointed out in an informative pre-concert talk, Ockeghem’s long service to the peripatetic French royal court under a succession of monarchs brought him into close contact with composers active throughout the Loire Valley and the neighboring Bourbon and Burgundian courts. It was not surprising for these composers, all of whom were highly-trained professional singers, to borrow from each other’s works, whether in a self-conscious gesture of homage to an acknowledged master or in competition with a contemporary. And to insert a secular song tune into a religious composition was not considered unseemly or sac-religious until the 19th century. We first heard a five-voice motet by Ockeghem’s near contemporary Johannes Regis (ca. 1425-1496). “Celsitonantis ave genitrix” (Hail, mother of the High-Thunderer), a setting of a classicizing text in humanistic hexameters, presented a massive “wall of sound,” as Professor Gallagher put it. 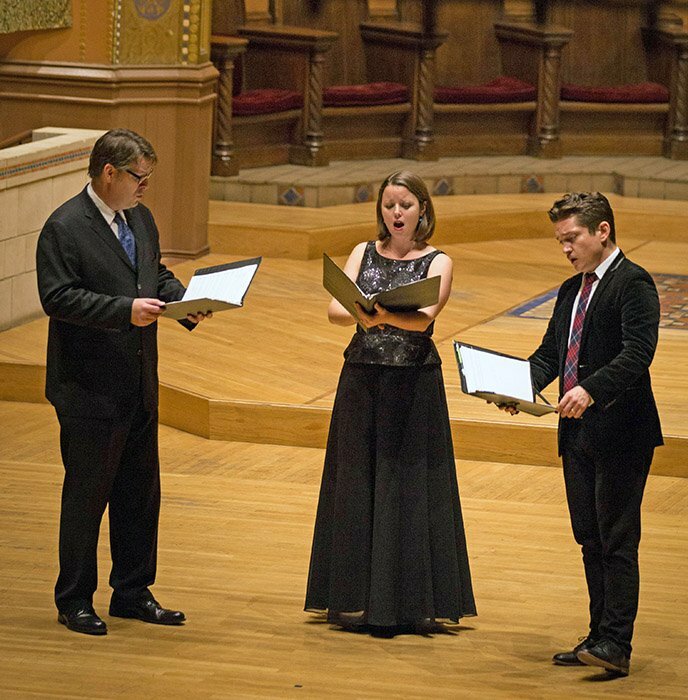 This sound complex consisted of an upper-voice pair (soprano Margot Rood and countertenor Martin Near) and a lower-voice pair (tenor Sumner Thompson and bass Paul Guttry) surrounding a chant tenor in long notes, the responsory “Abrahe fit promissio” (A promise is made to Abraham) sung by Jason McStoots. All voices joined in increased rhythmic activity toward the end of each of the two sections. Overlapping entries in the imitative duets resulted in a highly fluid phrase structure, with no consistent sense of “downbeat.” Singing without conductor, these well-rehearsed singers were so attuned to one another, and so deeply immersed in the subtleties of 15th-century polyphonic interweaving, as to make it sound completely natural and inevitable. An altogether different sort of musical texture, that of a cantus (top voice) and tenor duo with accompanying (and harmonically non-essential) contratenor part, was typical of 15th-century songs. “Au travail suis” (I am in agony), by one Barbingant, follows this pattern. Here Margot Rood and tenor Stefan Reed formed a mellifluous pair, opening most lines in imitation, then melting into decorative melismas at the ends of phrases. Joining them, Scott Metcalfe took up the wayward contratenor part on his sweet-toned medieval fiddle. Almost nothing is known of Barbingant, except that he died before Ockeghem, and only a few compositions by him survive. The fourth line of his rondeau, at the words [“Mays c’est pour ce que je ne puis veoir]/Ma maistresse ainsi qu’aultres feroient” (But it is because I cannot see/My mistress as others may do) quotes the striking opening motive of Ockeghem’s much admired early song “Ma maistresse” in imitation at the octave. Ockeghem returned the compliment by incorporating Barbingant’s song as a freely paraphrased cantus firmus in the Kyrie of his four-voice Missa Au travail suis, and the song’s opening motive, often in imitation, at the beginning of the other four movements of the mass. We heard the Kyrie and Gloria, sung by Martin Near, Owen McIntosh (on contratenor),and basses Paul Guttry and David McFerrin right after Barbingant’s song, and the Credo, Sanctus, and Agnus Dei during the second half of the program, with Margot Rood participating in the Sanctus and Agnus and Stefan Reed alternating with Owen McIntosh in the Sanctus. Outstanding features of this performance were the sensitive phrasing in the Kyrie and the varied and beautifully attuned duet pairings in the Gloria. The Credo expounded the life of Christ and the subsequent statements of belief in a series of well-articulated points of imitation. French-tinged Latin diction, delivered with assurance, shaped each phrase and clarified it rhythmically. In the Sanctus, full-voiced block chords on “Osanna” contrasted with lively duets in the “Benedictus:” soprano and bass I, contratenor and bass II, bass I and II. Maximum solemnity was attained in the second part of the Agnus Dei, with its slow ternary meter and very low tessitura on “Miserere nobis” (Have mercy on us). Ockeghem’s four-voice Credo sine nomine (Credo without a name) stands on its own and is not part of a complete polyphonic setting of the mass Ordinary. It is built on the Gregorian melody for Credo I in the Roman Gradual, which migrates freely from one voice to another rather than remaining exclusively in the tenor. Metcalfe’s program note pointed to the similarity between its setting of the words “Et incarnatus . . .” and the setting of the same text in the Missa Au travail suis, an apparent bit of self-borrowing on Ockeghem’s part, although “we do not know which work quotes which,” The Credo’s declamatory style was articulated with engaging rhythmic vitality by the cohesive quartet of singers (Near, McStoots, Thompson, and Guttry). Although one might think the treasure trove of 15th-century manuscripts to have been exhaustively worked over by now, new sources do occasionally turn up. One such gem is the “Leuven Chansonnier,” a tiny song book probably copied in France in the 1470s and rediscovered only three years ago. It contains 50 songs, some well known, such as “Au travail suis” and “Ma maistresse,” and others that appear in no other known source. One of these, the anonymous bergerette “En atendant vostre venue” quotes, in its fourth line, the first line of Ockeghem’s rondeau “Quant de vous seul je pers la veue.” In this premiere performance, Margot Rood’s lovely clear soprano floated above Owen McIntosh’s well-matched tenor and Sumner Thompson’s supporting contratenor. In a less elevated tone, Firminus Caron’s “Cent mil escuz ” (A hundred thousand escus) brings yet another composer into Ockeghem’s circle. Sean Gallagher has noted that the rondeau’s fifth line, occupying a prominent place at the conclusion of its refrain, closely resembles the opening of Ockeghem’s “Ma maistresse.” Singers Near, McStoots, and McFerrin employed comically emphatic diction to highlight the humor of this meditation on what one could do if only one had a lot of money. Ockeghem’s “Ma Maistresse et ma plus grant amye” (My lady and my greatest friend), composed around 1450, is one of his loveliest and most accomplished. The opening motive with its unusual sequence of falling minor thirds is accompanied in the tenor by the same motive in a different rhythmic guise, and the part writing is lively throughout, with many imitations and sequential patterns along with rich harmonies. The Missa Ma Maistresse consists only of a Kyrie and a Gloria; no other movements have survived, The Kyrie takes the entire first section of the song tenor as its bass, with a free paraphrase in the tenor; the Gloria quotes the first section of the cantus melody in the contratenor, followed by the second section in the tenor, with a final reprise of the song opening at the words “In gloria Dei Patris, Amen.” Shorter quotations from both the cantus and the tenor of the song can be clearly heard throughout both movements; the opening of the Kyrie even extends the canonic trick of the song opening by citing its characteristic motive in four different metric configurations. Performed by Margot Rood, Owen McIntosh, Stefan Reed, and David McFerrin, each voice contributed its individual color and character to an integrated whole. This was a truly glorious ending to a glorious evening. Looking down from his perch in the firmament of great composers as he approaches the 600th anniversary of his presumed date of birth, Johannes Ockeghem can safely conclude that his music is alive and well.